Dr. Edward Tobinick might not be a quack, but his behavior suggest otherwise. Having a medical degree does not mean not a quack. Using FDA (Food and Drug Administration) approved drugs does not mean not a quack. Having a medical web site that does not have the word “quantum” all over the place does not mean not a quack. Threatening to sue people for writing about the lack of evidence for his treatments does not mean not a quack. Dr. Edward Tobinick is suing Science-Based Medicine for writing about Dr. Edward Tobinick’s dubious medical practices. That strongly suggests that Dr. Edward Tobinick is a quack. Essentially, what Dr. Edward Tobinick is saying is, Your valid criticism of the way I apparently take advantage of patients might discourage patients from shelling out money for my untested treatment. Your valid criticism of the way I apparently take advantage of patients might encourage patients to ask reasonable questions about my untested treatment – questions that I cannot honestly answer. Etanercept might work, but so might steroids, or ribavarin, or eye of newt, or a kick in the groin. All of these treatments are equally valid. Oddly, the patients receiving a kick in the groin will probably report the fewest symptoms after treatment. 90% of the kick in the groin patients claimed to be cured and not in need of any further treatment. Without evidence, and with his opposition to evidence, Dr. Edward Tobinick is just a quack with a brainstorm. Nothing original there. Dr. Edward Tobinick injects etanercept (Enbrel) around the spine. This is not something he covered in his dermatology residency, so has he injected etanercept into the spine yet? Why etanercept? Etanercept is an immune suppression/anti-inflammation drug. Inflammation is a problem with everything, so preventing/reversing inflammation is the simplistic cure. If this worked in real people, and not just in the hypotheses of pathophysiologists, steroids would have cured everything decades ago. Perhaps Dr. Edward Tobinick is imitating Dr. Michael Bracken, who is able to produce improved outcomes with steroids (anti-inflammation drugs) for spinal injury, but only when he is in charge of the data. At least Dr. Michael Bracken published some research to support his claims. Dr. Edward Tobinick just wants us to believe that his interpretation of pathophysiology is miraculously prescient. Evidence? We ain’t got no evidence. We don’t need no evidence! I don’t have to show you any stinkin’ evidence! Maybe Dr. Edward Tobinick does have some valid evidence. Here are a couple of comments by Dr. Novella on science and the importance of evidence. They probably were not directed specifically at Dr. Edward Tobinick, but they do apply to him. What do you think science is? There’s nothing magical about science. It is simply a systematic way for carefully and thoroughly observing nature and using consistent logic to evaluate results. Which part of that exactly do you disagree with? Do you disagree with being thorough? Using careful observation? Being systematic? Or using consistent logic? Science is the way we learn what works. Dr. Edward Tobinick’s criticism is evidence that he does not understand science. Is any treatment, that is not based on evidence, likely to provide a benefit to patients? History is strewn with ideas that were intuitive and made sense at the time, but were also hopelessly wrong. Alternative medicine, opposition to EBM (Evidence Based Medicine), and opposition to SBM (Science-Based Medicine) are all the same mistake – evidence denialism. Evidence denialism is devotion to being hopelessly wrong and remaining ignorant of being wrong. 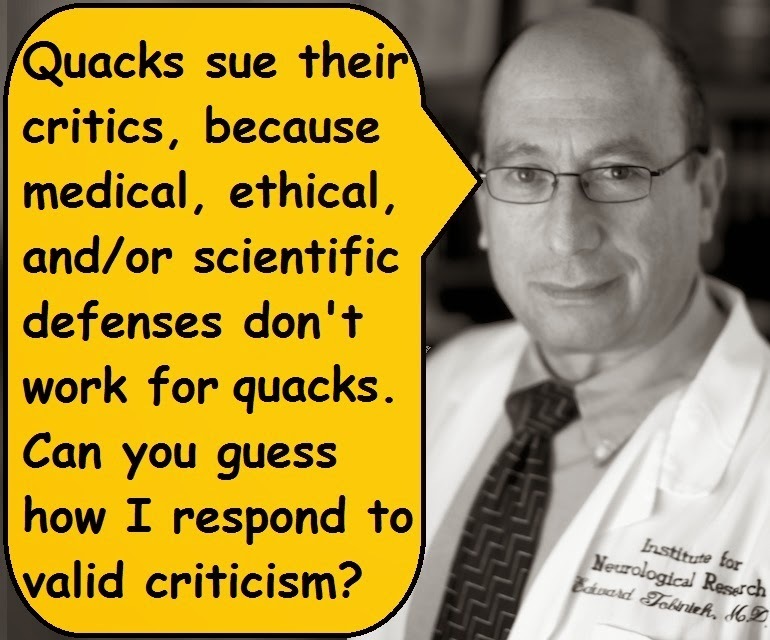 Maybe there is no such thing as bad publicity for a quack, but the publicity associated with this law suit means that people will associate the name quack with Dr. Edward Tobinick, or vice versa. Dr. Edward Tobinick is stating I am not a quack. I, Dr. Edward Tobinick, am a quack. Rogue Medic says Epinephrine is no good. I have been critical of epinephrine because we are routinely giving epinephrine in cardiac arrest, but we do not have any evidence that epinephrine improves any outcome that matters. ROSC (Return Of Spontaneous Circulation) is not an outcome that matters. Epinephrine does improve ROSC, but there is no increase in people leaving the hospital with good brain function (the outcome that matters and surviving for more time is better). There is evidence of harm. The evidence of harm is not great, but the evidence of benefit does not exist. More ROSC, but fewer survivors. That is not a benefit. I do not claim that epinephrine is good, bad, or neutral. 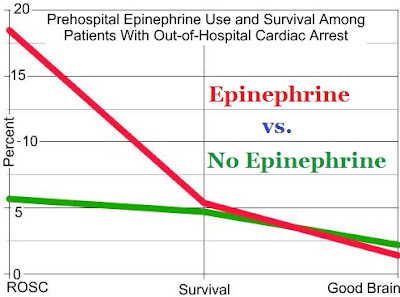 I point out that there is probably a subset of cardiac arrest patients who do benefit from epinephrine, but we have no way of knowing who those patients are. I describe the lack of evidence of benefit and explain that standards of care should be supported by valid evidence of improved outcomes. He says backboards are no good. There is also no valid evidence of improved outcomes with backboards for unstable spinal fractures. Where is the evidence that using backboards on patients with unstable spinal fractures results in fewer disabled patients (the outcome that matters)? There is evidence of harm. The evidence of harm is not great, but the evidence of benefit does not exist. Rogue Medic disagrees about a lot of things that scientists have said are “best practices” for EMS. I disagree with using treatments that are not based on valid science. I disagree even more strongly with standards of care that are not based on valid science. In most instances this medic with over 40 years experience agrees with Mr Rogue Medic. Not because of the science, but because of my experience. That is not a very good reason for disagreeing with standards of care. It is a good reason for asking questions of the people who would know about the evidence, but even a 40 year career is just a series of anecdotal experiences. What kind of control has been used to minimize the effects of bias? What has been done to make sure that confirmation bias does not limit recollection to those anecdotes that support individual bias? But disagree with him on global warming? He calls you a science denier and says you can’t think for yourself. I described some of the reasons you appear to be a science denialist above. That is science denialism on the topic of EMS. You would get the same responses to EMS science denialism if you understood climate change. There are people who are willing to agree with science when it agrees with their prejudices, but are science denialists when science does not confirm their prejudices. The problem is with the people, not with science. Science does not care about prejudices. Science just tells us what is real. Because science is not perfect, it depends on confirmation by different methods and by replication (preferably more than once). And most of all, science depends on rigorous attempts at objectivity, because everyone has biases. Science does not exist to confirm biases. Fact of the matter is, I am thinking for myself in terms of climate change. I’m not the guy following the crowd. Just as you are not the guy following the crowd with EMS best practice. I am the guy basing decisions on science. You appear to be the guy claiming that science does not matter. You appear to be the guy basing decisions on politics. It isn’t the decision that matters, but the way we get there. Political decisions should be made based on valid science, rather than denying science or trying to make science fit political goals. BTW, make sure your furnace is working, things are about to get colder, starting tomorrow. Now you are discussing weather. You do not appear to know the difference between weather and climate, but you seem to think that you know enough to tell scientists that they are wrong. Out-of-hospital spinal immobilization: its effect on neurologic injury. Why use Rush Limbaugh and his liberal twin, Michael Moore, as examples? Because these two are irresponsible in their presentation of information and they have a lot of gullible followers. Rush Limbaugh is actually known for followers who are too ignorant to have thoughts of their own. They call themselves ditto heads. Popular Science is eliminating comments from their stories, because there is so much nonsense in the comment section that it detracts from the science reporting. Limbaugh is whining that the scientifically illiterate will be deprived of their ability to throw anti-science tantrums on this science site. People with more spare time than sense are being told that their ignorance is not as good as a scientist’s education. The horror. The horror. Don’t have your vehicle fixed by an expert (mechanic), since expertise is bad. Don’t have your illness treated by an expert (physician), since expertise is bad. Should Jenny McCarthy and her University of Google followers be treated as if they know what they are doing? When it comes to science, is Jenny McCarthy any different from Rush Limbaugh? Climate change denialists (people who pretend that reality is not real) have been insisting that the planet is not warming because the yearly temperature does not move in a straight line and they seem to think in the most simple terms. If we were treating a septic patient, should we rejoice that his peripheral temperature (skin, arms, legs) is coming down? Should we assume that the patient is getting better by cherry picking data that appears to support what we want to happen? An expert (physician) should ignore the predictable anomaly and realize that the core temperature is what matters. Should the septic patient be treated according to science, or should we make treatment about politics? cranks tend not to mind the crankery of others, since they see themselves as opposed to a scientific orthodoxy. Consistency be damned, they just want to see science with egg on its face so they can prove that they are being persecuted. Rush Limbaugh, Michael Moore, Jenny McCarthy, . . . are cranks. They do not understand science and cannot tell the difference between nonsense and science. Climate change is not politics. Ways of dealing with climate change will involve politics. Persuading people that climate change is politics is one way of avoiding science and claiming that any ignorant criticism is as valid as understanding science. Why We’re Shutting Off Our Comments – Starting today, PopularScience.com will no longer accept comments on new articles. Here’s why. Link to Quick Hits Page – there does not appear to be any link to the actual article by Limbaugh. What do I mean by stupid? This is an excellent example of stupid. Florida country radio morning-show hosts Val St. John and Scott Fish are currently serving indefinite suspensions and possibly worse over a successful April Fools’ Day prank. They told their listeners that “dihydrogen monoxide” was coming out of the taps throughout the Fort Myers area. Two Hs and One O. We can rearrange these into the familiar chemical expression of H2O. Danger! There is H2 in the drinking water! I hope so. Water is not water, if there is no H2O. Dihydrogen monoxide is just water. Have a laugh at yourself and get on with your day. That would have been too reasonable. This was the response – and threats of felony charges. 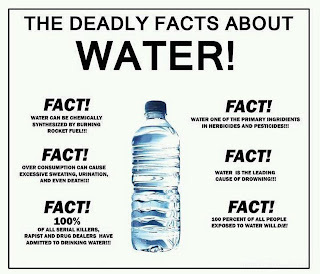 Don’t tell people that there is dihydrogen monoxide in the water! Tell them that the reported problem is just a prank, but do not use the opportunity to educate people about what you sell them. There is water in the water. – That is not a false water quality issue unless you are an idiot. There are idiots making threatening to bring felony charges to try to deflect attention from the stupidity of the idiots. – That is a real water quality issue. What we call it has nothing to do with what it is. Water is dihydrogen monoxide is H2O. Water has also probably had every deadly disease in it for as long as there has been water. People, and other animals defecate in that water. The water company cleans the water that they provide to us. The result is that tap water is almost always much cleaner than the bottled water you buy in a store. We also fluoridate water in many places. fluoride protects teeth. The result is that the water is healthier with fluoride than without fluoride. Some people make the mistake of thinking that a complicated name means that something is dangerous. Or they think that a chemical is more dangerous than something that is natural. Or they think that something man made is more dangerous than something that is natural. That is not just wrong, it is Jenny McCarthy wrong, it is Creationist wrong, it is climate change denialist wrong, it is homeopathy wrong, it is just plain stupid, but too many of us are afraid to tell stupid people to stop spreading their stupidity, because we think that is not nice. By that niceness, we lower ourselves to their level of stupidity. How many scientists support Jenny McCarthy’s anti-vaccine conspiracy theories? Only a handful – and they seem to make money off of it. How many scientists support Creationism’s anti-evolution conspiracy theories? Only a handful – and they seem to make money off of it. How many scientists support climate change denialists’ conspiracy theories? Only a handful – and they seem to make money off of it. How many scientists support homeopathy’s anti-medicine conspiracy theories? Only a handful – and they seem to make money off of it. We give these con men equal time out of some distorted sense of balance between reality and their even more distorted misunderstanding of reality. Maybe these nuts should go hug a unicorn and leave sensible people alone. The cure is education, not denialism. 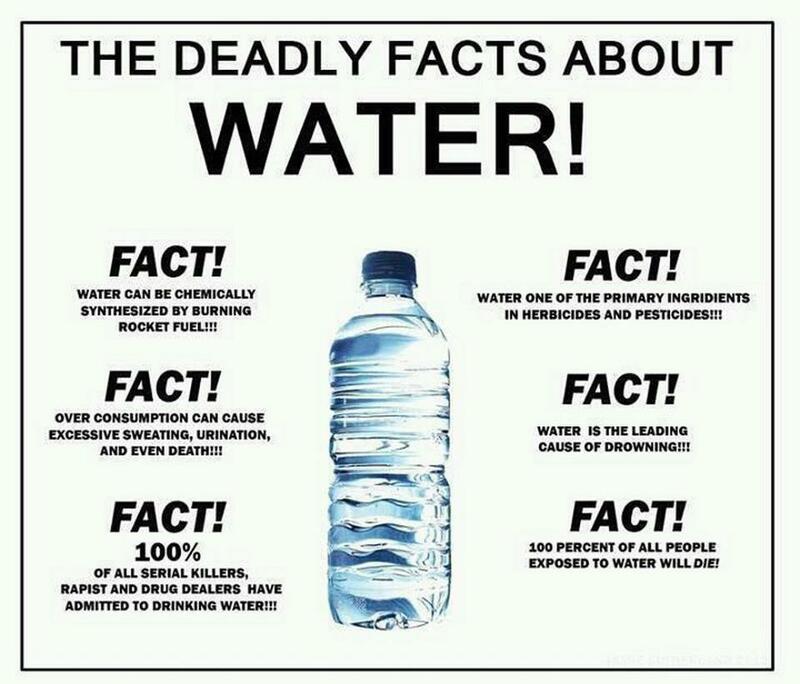 I do not know the origin of the Deadly Facts About Water poster. If you know, please send me the link and I will give credit. This poster is great. Update, Wednesday: St. John and Fish were back on the air Wednesday, and officials with the local health department tell The Atlantic Wire that felony charges are not expected. Maybe somebody did point out that criminal charges would be stupid and open them up to ridicule, but I had already written this when that update was posted.